I’m what I like to call a “thinker,” somewhere on the same vein as Socrates or Confucius (I kid). I tend to fall into deep thought about life’s least understood wonders and the evolution of humans is a constant train of thought. Considering the history and drama in the lives of the Caveman during their evolution of mind, it shocks me that Kubrick’s epic 2001: A Space Odyssey is one of the few films to have successfully and seriously visited the topic. 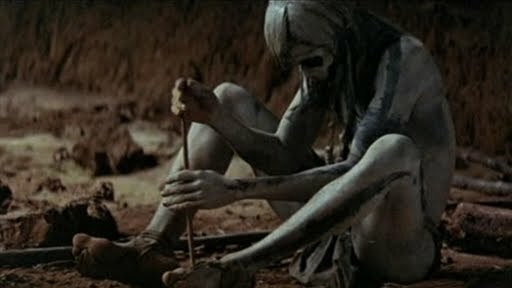 Aside from Ringo Starr’s masterpiece Caveman, the quintessential Caveman film would have to be Quest for Fire, an all-around great film that gives an insightful view into the colonization and development of man in prehistory. Quest for Fire shows the primitive attempts of maintaining fire by the Ulam tribe, a group of Neanderthals. Aware of the tangibility of fire, the Ulams keep a 24/7 guard post to protect their fire from wind and enemies desperate to steal their precious resource. However they are ambushed by a barbaric ape-like clan and forced to relocate their home to a cold marsh area. Unaware of moisture’s effect on fire they are devastated when their remaining flame is extinguished. Three members of the clan are sent on a quest to bring back fire to which they reluctantly accept; thus starting one of the greatest quests ever. The Ulam trio’s journey leads them across the path of various tribes in varying stages of development from a brutal cannibalistic tribe to the most technically advanced Ivaka tribe (not Ivanka). The leader of the trio, Naoh (Everett McGill), soon begins to bond with Ivaka member Ika (Rae Dawn Chong) and from her and her tribe learns the new advancement of humans such as pottery, houses, and in one of the most beautifully constructed scenes I’ve ever watched, he learns that fire can be created. 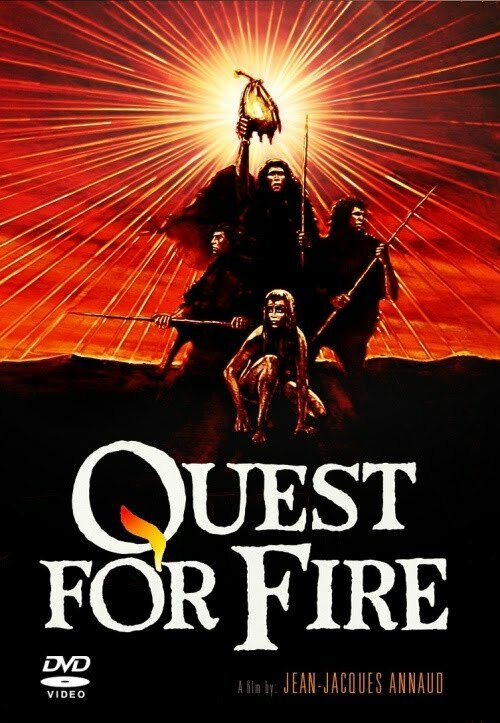 Quest for Fire takes an age old story made famous by Homer’s “The Odyssey” and reaffirms the timelessness of the tale by setting it in prehistory with the quest for fire being possibly the first actual “odyssey” of man. While the film may not be historically accurate, Quest for Fire is just frankly a damn good movie that I found to be fantastic. It’s a great depiction on a theory of the evolution of man and how intersecting with other tribes led to the everlasting expansion of the mind. In one scene Ika, the most technically and mentally advanced among the Ulams introduces the group to laughter after one of the men is hit on the head. The three are confused by her reaction and the length of her loud cackling however by the end of the film they develop an understanding and appreciation for laughter and the beauty of the god given gift schadenfreude. Quest of Fire doesn’t have a savvy script filled with zingers or great one-liners, instead there’s only made up languages and grunts. Yet though each actor’s body and the directors visual eye the overall story is fascinating and every aspect of the film is understood (“auta” mean fire by the way). Quest for Fire is just a simple story that involves romance, drama, and comedy along with great costume design, makeup, and terrific acting. It’s the type of movie that you can watch with your brain off but its better when you become engaged and think of the dawn of man and our own existence.